Line a 9x13 baking dish with foil, leave some overhang to form removal easier. Spray foil munificently with slippy preparation spray. within the bowl of a stand mixer, beat butter, refined sugar, and sugar along till flossy. Add in eggs and flavorer and still beat. Lower speed of mixer and add flour, sodium bicarbonate and salt and blend till combined. Add M&M's and mini chocolate chips and provides a final stir, reserving some M&M's and mini chocolate chips for topping cookie bars. Transfer cookie dough to ready baking dish. Press further M&M'S and chocolate chips into high of cookie dough. Bake thirty five to forty minutes on kitchen appliance rack in lower third of kitchen appliance to stop over browning. Let cool fully and cut. 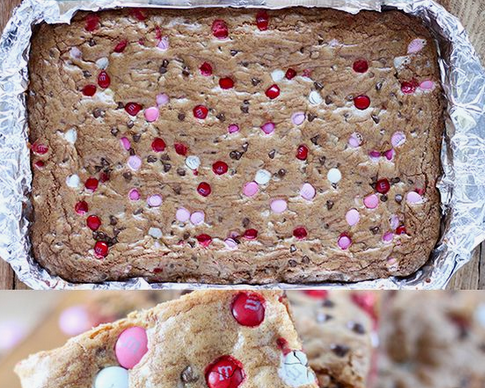 0 Response to "M&M's Valentine's Day Cookie Bars"